Paperback, 6.75 x 9.25 in. / 112 pgs / 40 color. Edited by Mats Stjernstedt. Text by Kirsty Bell, Edwin Carels, Tytti Rantanen, Chris Sharp, Cecilia Widenheim, Kaelen Wilson-Goldie. 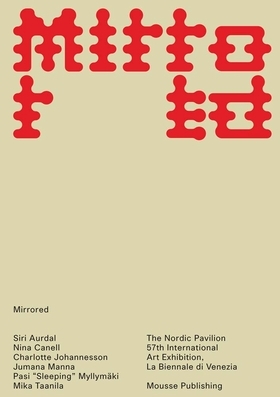 Mirrored accompanies the eponymous exhibition at the Nordic Pavilion at the 57th Venice Biennale, featuring works by six artists from different generations: Siri Aurdal, Nina Canell, Charlotte Johannesson, Jumana Manna, Pasi “Sleeping” Myllymäki and Mika Taanila. FORMAT: Pbk, 6.75 x 9.25 in. / 112 pgs / 40 color.